Soak both the rice and dal together for atleast 2 hours. Grind it to get a coarse batter. Add salt, asafoetida and allow it to ferment for atleast 8 to 10 hours. Before making idlis, add the cumin seeds, pepper, finely chopped curry leaves, ginger and ghee. Steam them in an idli cooker, preferably in a plate. When the idli is done, cut them into pieces and serve with chutneys and sambhar. 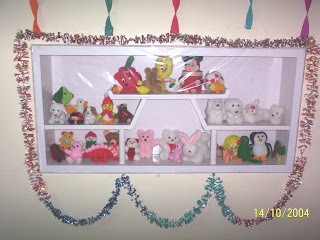 Snaps of golu and soft toys during Navratri at our house in Chandigarh during year 2004. Got this snap now. Wash the sago and keep it close for a while. Sprinkle some water in between and keep it closed for about 15-20 minutes. Heat the ghee, add the cashews. When it starts changing colour, add the sago and some water. Keep mixing it else it will stick to the vessel. Keep adding some water till sago gets cooked. Add sugar and mix well. Allow it to cool for some time. Add the milk. Soak the cashews in hot water for about 2 hours. Grind to a fine paste. Soak the saffron in a little milk for some time. In a nonstick pan, add the paste, sugar, saffron, elaichi powder and mix well. Add the ghee little by little and keep mixing it well. You could even add a pinch of red orange colour if required as i did. When it starts leaving the sides of the vessel, transfer the contents to a greased bowl. Either you can serve it that way or else, spread them out on a greased plate and cut them into pieces. Pongal is a very important festival for the people of Tamilnadu. It falls during mid January and the celebrations are spread over four days. The first day special food includes vada, payasam, moru kuzhambu and boli. On the second day Sakkarai Pongal, Ven Pongal, Medhu Vada and Payasam is prepared. On the third day, varieties of mixed rice like curd rice, tomato rice, puliyogare, aviyal, coconut rice and lemon rice is prepared. Tamil New year falls during mid April and Medhu Vada, Payasam and mango pachadi are the main food items prepared. 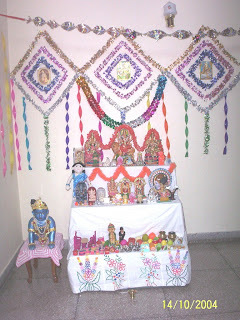 Krishnajayanti festival is also known as janmasthami or gokulasthami. It falls during the months of July and August. Various sweets and savouries are prepared. The most important items are butter, sukku vellam, sugiyan, uppu seedai, vella seedai and vada. Ganesh chaturthi or pillaiyar chaturthi celebrates Lord Ganesha's presence on earth for 11 days. It falls during the months of August and September. Kozhakattai, Sundal, Payasam and vada are prepared for this festival. Navratri festival is spread over 9 days and each day a different kind of sundal is prepared. For saraswati pooja, vada, Payasam and black chick peas sundal is prepared. Here's the recipe for white chick peas sundal and payaru (whole moong) sundal. Check out other navratri related tips and golu snaps here. Diwali is the festival of lights and various sweets and savouries are prepared apart from vadai, Payasam. Check out sweets and savouries recipes here for diwali. This is my entry to the RCI-Festival Cuisine event of Viji. Pressure cook whole moong or payaru and red gram dal. Soak tamarind in water and extract the juice. Heat oil, add mustard seeds and fenugreek seeds. When it starts spluttering, add the tamarind juice, turmeric powder, sambar powder, salt, curry leaves and asafoetida. When it starts boiling, add cooked dal and whole moong. 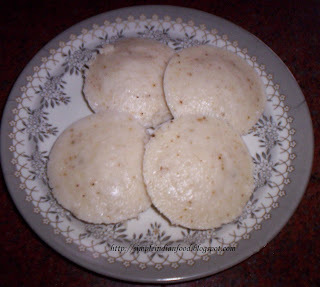 If required add dilute paste of rice flour to make the kuzhambu thick. You could also use sprouts instead of moong. This is my simple version of veg burger. Mash the boiled potatoes. Add turmeric powder, red chilli powder, salt and garam masala powder. Mix well and make big balls and flatten them to make cutlets. Heat tava, place cutlets on them and add few drops of oil. When it turns golden brown, change sides and cook on other side also. Cut the burger bun into two pieces. Spread some tomato sauce on both sides. Place the cutlet on the lower half. Spread out the cheese slice. Cut tomatoes into thin slices and place them on the cutlet. Finally place a cabbage leaf on it and cover it with the upper half of the burger bun. Soak the moong and rice together for atleast 8 hours. Grind it along with salt, ginger and green chillies. Make dosa from the batter, but slightly thicker. 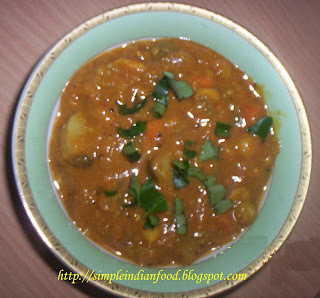 Serve with any chutney, sambhar. Dry roast the sesame seeds. In a little oil, seperately roast the blackgram dal and red chillies. Grind all the three together with asafoetida. Spread out the rice to cook, add this powder, salt and gingelly oil. Mix lightly. Elluhora is ready to serve. Use the leftover sundal as stuffing for parathas. Just add some ajwain powder, red chilli powder, salt and boiled potatoes if any, mash well and make parathas the usual way. Enjoy with curd and pickles. Grind the rava and sugar together in the mixie to get a fine powder. Roast the cashews in little ghee and add it to the powder. Add dry grapes and cardamom powder. Melt ghee (you will require between 1/4 cup to 1/2 cup, depending on how you prefer it) and mix well with the dry powder. Make small round balls. Quick rava ladoo ready in five minutes flat. 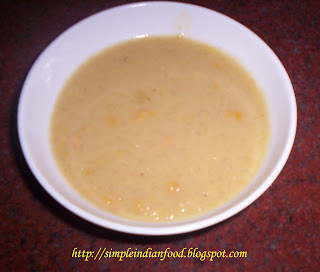 Refrigerate the leftover sundal and use it while making sambhar the next day. Soak the chick peas overnight and pressure cook to make it soft. Grind the coconut and masala powder together. Heat oil, add mustard seeds, bengalgram dal and black gram dal. When it starts spluttering, add the cooked chick peas, turmeric powder, salt and masala powder. View individual rangolis Here... one for Goddess Laxmi, one for Goddess Saraswati and one for Goddess Durga. Heat oil and add cumin seeds. When it starts spluttering add the leftover sundal and tamarind juice to give it a gravy consistency. Add the red chilli powder, cumin seeds powder, coriander seeds powder, garam masala powder, turmeric powder and salt. Remember to adjust salt as the sundal already has some. When it boils to become a little thick, transfer to serving bowl. Add the finely chopped tomatoes, onions, carrot, sweet chutney, green chutney and nylon sev as per individual taste. Grind tomato along with ginger, cumin seeds powder, coriander seeds powder. Add salt and cook on low flame for five minutes. Add the leftover sundal. Heat a little ghee and add some cumin seeds. When it splutters, add it to the paste and cook on medium flame till everything gets well mixed. Garnish with coriander leaves and serve with hot chapatis or rice. Watch out the space tommorrow for the next interesting tip to utilise leftover sundal. Navratri is here and all of us make sundal at home. Make this masala powder at once for the entire Navratri festival and store it in an airtight container. All you have to do daily is to cook the sundal first with salt, curry leaves and asafoetida and then add this masala powder to it after grinding it with some coconut. Roast all of them without oil till colour changes, cool them and grind to a coarse powder. Dont worry if you end up with more powder, you can always add them to the vegetables you prepare daily. Roast the cashews and raisins in ghee and keep them aside. Add some hot milk before serving. Dry roast the dals and red chillies. Remove the thread inside each banana flower petal and cook with little water for about 10 minutes. Allow it to cool. Grind it along with asafoetida and salt to get a coarse paste. Add water if required. This goes well with rice and can also be a good substitute for the normal chutneys for dosas and idlis. Although it would be slightly bitter in taste, it is very good for health. Mix maida, baking powder, rice flour, lemon yellow colour and curd well. The batter should be of drop-down consistency. If required add little water. Make a cone using some thick plastic sheet like that of milk covers. Mix the sugar and water and heat it to get a sticky syrup. Add the batter to the cone and make jalebis directly in hot oil. Turn to get golden brown colour on both sides. Remove and directly put it into the sugar syrup and let it soak in it for about a minute. It tastes good even with a scoop of icecream. Pressure cook Colacasia and remove the skin. Cut into medium sized pieces. Add salt, turmeric powder, red chilli powder and asafoetida to it and mix well. Add the bengalgram flour and rice flour to the colacasia and deep fry them. This consumes more oil. Heat the oil, add some mustard seeds, bengalgram dal and blackgram dal. When it starts spluttering, add the colacasia (mixed with spices) and cook covered for some time. Keep mixing it well in between. In about 10 minutes, you will get the roasted look. You could also add a little bit of tamarind paste to the second version to give it a tangy taste. This goes very well with rice varieties. Simple Indian Food is now a part of the growing Food Blogroll of Queen. It helps me to connect to other food bloggers throughout the world. Wash the curry leaves and dry them well. Roast the dals and red chillies and grind to a coarse powder. Add the curry leaves, salt and asafoetida and grind well again to get coarse powder. Mix with rice and serve. It is very nutritious too. Alternatively you can even omit the red chillies, salt and asafoetida, grind the rest and use it for everyday cooking. This way you can make sure that curry leaves is consumed as many people tend to remove it from food. Grind the tomato and ginger to a fine paste. Heat oil, add cumin seeds. Add the tomato paste, salt, turmeric powder, red chilli powder, cumin seeds powder, coriander seeds powder and garam masala and allow it to cook for five minutes. Add the boiled carrots and peas and bring it to a boil. If the gravy is very thick, add some water and if it is too watery, add a paste of bengalgram dal powder and water and stir well. Garnish with finely chopped coriander leaves and serve with chapatis and puris. The tangy taste of tomato and sweetness of peas and carrot make a unique combination. 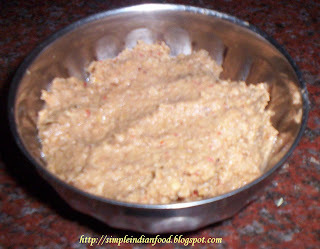 Grind it along with coconut, asafoetida and salt to get a coarse paste. This goes very well with rice and can also be a good substitute for the normal chutneys for dosas and idlis. This is an easy recipe that can be made in a jiffy and makes a good packed lunch too. Grind the tomatoes to a fine paste in the blender. Heat a spoon of oil in a kadai and add mustard seeds. When mustard seeds splutter, add both the dals and green chilly and fry and add asafotedia. Add onions and fry for 2 mins. Add the tomato paste and salt to taste. Let the paste cook for some time till the raw smell disappears. By this time, the paste would have turned thick and become bright red in colour. Add chilly powder if required. Cool the paste. Spread the cooked rice on a plate and add a spoon of oil to the rice and mix well. Add salt as per the quantity of rice. Next mix in the tomato paste and adjust the salt/spicy flavors. Garnish with chopped coriander leaves and serve. Wash the potatoes, cut into small pieces (without peeling the skin) and put the same in water. Heat oil in a kadai, add mustard seeds, both dals and asafotedia. Take fistfuls of cut potatoes in your hand, squeeze the excess water and add in the kadai. Add salt and masala powders and mix well. You will notice that some water is present in the kadai inspite of squeezing off the same from the potatoes. Cover the kadai with a lid and cook for sometime. As the potatoes are cut into small pieces, they will get cooked soon, so keep checking frequently. When the potatoes are cooked and the water has evaporated, garnish with coriander leaves and serve. This curry gets ready in a short time. Roast the masala ingredients and grind it to a fine paste using water. Heat oil and add mustard seeds. When it starts spluttering, add turmeric powder, curry leaves and tamarind juice. Allow it to boil. Add the boiled vegetables. If too thick add some water. Add salt and asafoetida and allow it to boil. It should be a bit thick consistency. If very watery, add some rice flour paste to the kootu.